Whether as part of a fountain, swimming pool, pond, cascade, waterfall or stream, the importance of an outdoor water feature should not be overlooked. As far back as the Ancient Greeks and Romans, water has been viewed not only as a necessity of life, but also as a thing of beauty. The Parthenon featured a reflective water floor to capture the beauty of the incredible temple. During the creation of the Roman Empire, water was incessantly featured, from still pools of water and simple bubbling basins to elaborate tiered creations and convoluted grottoes. HSBC’s swimming pool in Mumbai, India features a giant aerial photograph of the New York City skyline. The design is intended to raise awareness about the threat of rising sea levels due to global warming, and is part of a $90 million project to tackle climate change. Interest in the pool is so great, HSBC are considering designing more pools for other cities. 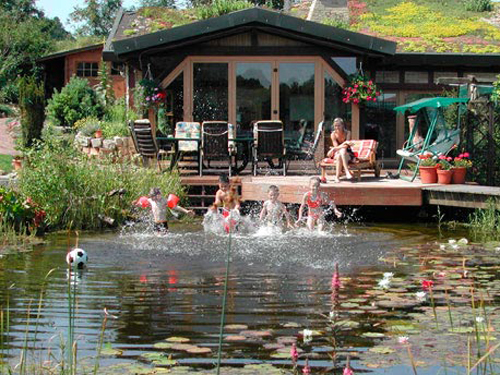 With the proper care, design and maintenance, natural swimming pools provide virtually no risk of contamination and respect both the environment and your health. Using an understanding of ecological systems, design and the latest in bio-technology, natural swimming pools make for some of the most innovative water features today. The materials and designs of natural pools can vary widely. Many are lined with rubber or reinforced polyethylene and feature aquatic vegetation, which acts as a biological filter. A small waterfall could also add ambience and help with water movement. If you are limited in outdoor space or you simply want to add an element of secrecy to your lawn, a hidden, underground pool could be just what you’re looking for. Generally, the idea is to show off your inground pool, but companies such as California-based Hidden Water Pools is aiming to change that with ingenious designs that allow you to switch from decorative patio to swimming pool and back again. With a simple flick of a switch, you could turn an expansive lawn, patio, dance floor or cricket pitch into a beautiful, hidden swimming pool. Once you’ve finished swimming, you simply flick the switch once more and you’re back to the original look! 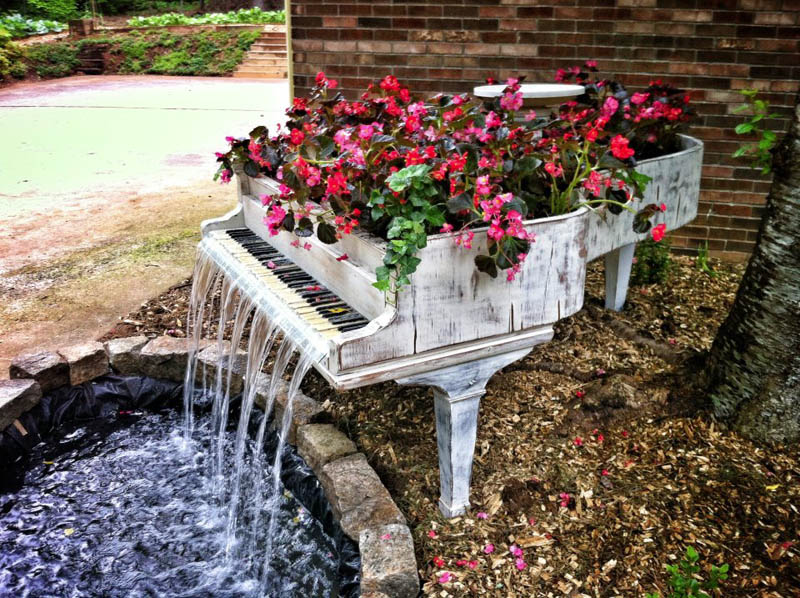 When Bill Metzgar found himself with an 1885 Steinway piano that had suffered severe termite damage, he decided to turn it into a water feature for his mum on Mother’s Day. It has a 2000 gallon per hour pump in the pond and a flex hose from the pump up to the piano, where PVC pipes then distribute water across the fibreglass resin sealed keys. The result is a clever water feature that reuses a classic unrepairable piece. Freestanding garden waterfalls add a special feature to an entranceway, patio or even your living room, and can be buried into the ground to create the effect of a natural waterfall. Below is an elegant waterfall featuring clear glass with a beautifully finished weathered bronze frame. Outdoor waterfalls come in all shapes and sizes, and another possibility is to create your own. Creating an outdoor waterfall focuses on two elements – the first being the pool in which the water falls and the second being the cascading structure. With careful planning and clever landscaping, a waterfall can be an affordable way to create an outdoor wow factor. 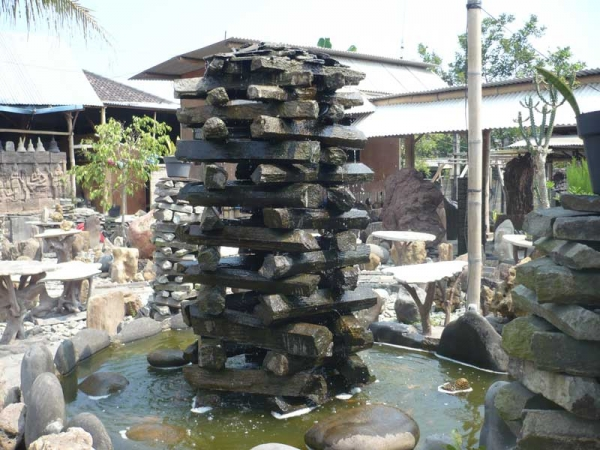 Water fountains are an easy way to add an exotic, spiritual, Venetian, eclectic or glamorous touch to your outdoor space. A water fountain is one of the most affordable ways to introduce a water element and designs are limitless. Common materials used include copper, natural stone, concrete and terrazzo. This water fountain is made of natural materials and draws the eye. Despite it appearing to look as though the structure is made of wood, it is in fact made of stone. 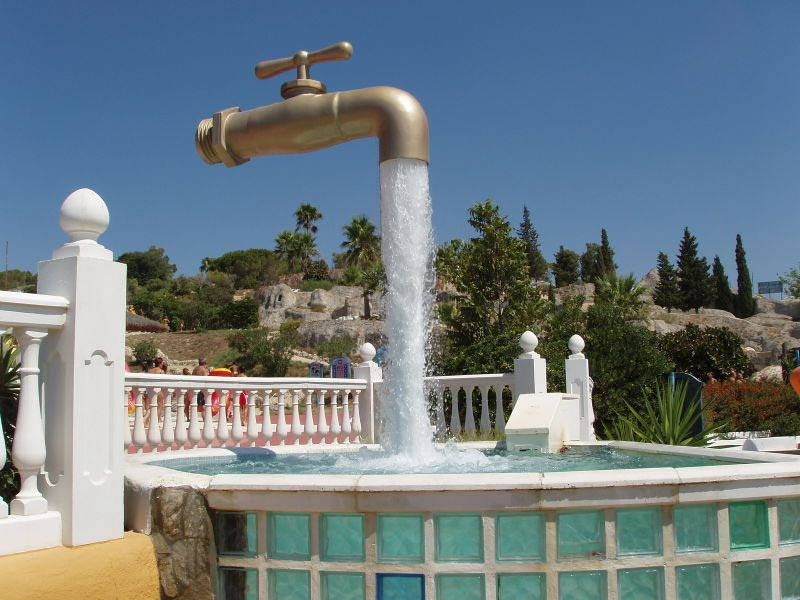 This floating tap fountain that can be found at Aqualand, Puerto de Santa Maria, Spain will have you scratching your head at first glance. It consists of a faucet mysteriously hovering above a pool, complete with an endless supply of gushing water. But where does the water come from? The “magic tap” effect is actually created using a transparent tube in the middle of the water column. This tube not only holds the tap in place, it also continually feeds the faucet with water pumped from below. The water goes up through the tube and exits at the top, and the water effectively hides the tube from view. 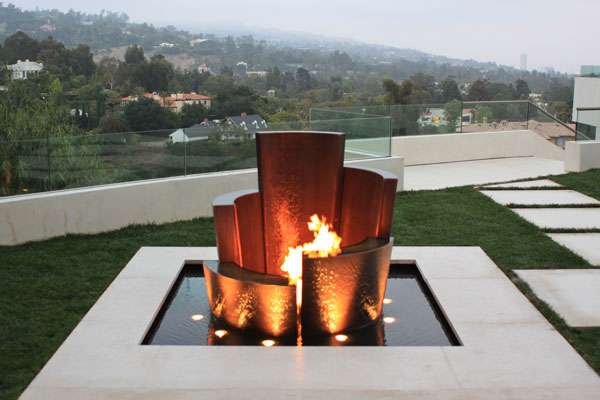 Water sculptures bring a unique take on more traditional water fountains and lend a contemporary feel to your outdoor space. 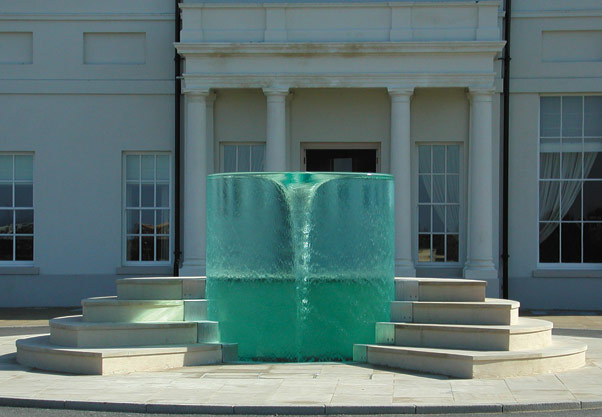 A water sculpture such as William Pye’s Charybdis, found at Seaham Hall, Sunderland, also makes for a spectacular welcome to your home. Charybdis is a circular movement of water inside a transparent acrylic cylinder that forms an air-core vortex in the centre. Steps wrap around the cylinder and allows spectators to view the vortex from above. The sculpture represents the moment Zeus struck Charybdis with a thunderbolt, turning her into a vortex as punishment for stealing the oxen of Hercules. If you are a music lover, you’ll fall in love with the outdoor pools designed by Cipriano Landscape Design and Custom Swimming Pools. 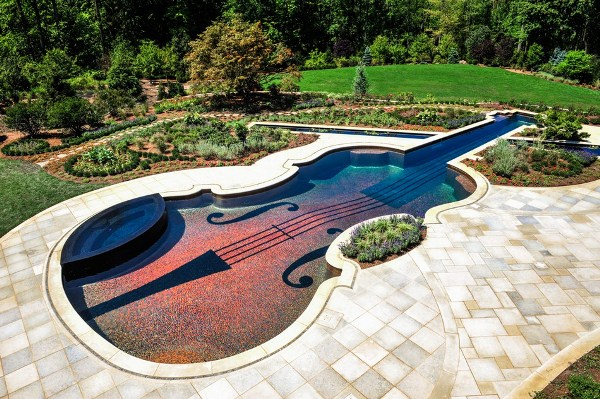 Using amazing accuracy and great lighting design, the company creates swimming pools that mimic Stradivarius violins. Stradivarius violins have often been compared to flowing water, therefore the source of inspiration is quite fitting. Pond designs vary greatly and can transform your garden on any budget. The tone and style of your pond can influence the overall feel of your garden, and should be complemented by its surroundings. Why not create a small wildlife pond, complete with tadpoles, frogs and newts, or stay traditional by introducing a formal Japanese Koi and goldfish pond? Perhaps you could include a modern sculpture to give your pond a more contemporary feel or centre a small pond with a unique ornament? No matter which way or how uniquely you choose to introduce water to your outdoor space, it’s essential that you seek expert advice on the right materials and the correct way to maintain your water feature. Different projects call for different materials, and if you want to create something that will last, finding the right tools is the key to good quality. Not only that, incorrect waterproofing and the wrong silicone sealant can lead to water flow that can damage surrounding areas and cause all kinds of costly problems. The grouting and adhesives will also need to be of the highest quality to prevent leakage and structural damage of your water feature. 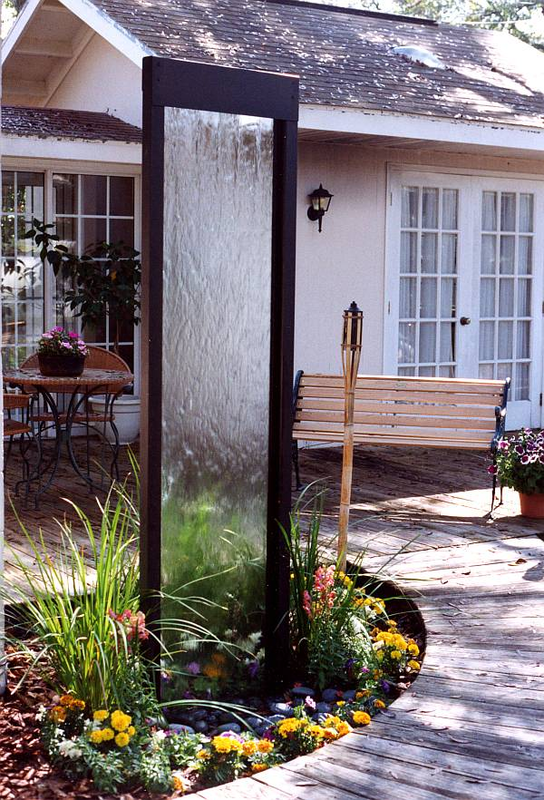 Have you recently installed a great water feature at your place? Tell us all about it on our Facebook page! This guest post is provided by Bellstone.